Presumably, the most users of Linux on the desktop have either a quite weird command prompt, derived from the machine their system is running on, or one that's stating their username twice, and really don't need the computer name part of it. You can easily change the command prompt, and/or shorten it so that you both have more space for the actual commands or can include other stuff that's more relevant for you. Or you may want to change the computer name for some reason. This is how to do both of that! The first thing you got to ask yourself, of course, is whether you need the computer name, also called "hostname", in your command prompt or not. That's important if you are logging in to other systems remotely, rarely done by the average desktop user. If the answer to that question is 'yes' but you want to change the hostname to something more nice or appropriate, or you want to change it for some other reason, you just need to change two entries in two different configuration files, as shown below. Host names may contain only alphanumeric characters, minus signs ("-"), and periods ("."). They must begin with an alphabetic character and end with an alphanumeric character. Open the concerning files with either of these commands. You will easily spot your currently set hostname; then just change it to your liking. Load both the concerning files in a text editor at the same time (whether it's on the CLI or GUI), and save them after another, twice, alternately - ignoring any possible upcoming warnings about intermittent changes, as that's exactly what we want to override. Re-check your "/etc/hosts" after editing both files, and after either running the below command or a reboot. This has the bonus that it would output an error message if the newly chosen hostname is invalid, so I in fact recommend that. Regardless of what Linux distribution you are running, to change the command prompt, you always need to change the settings for the "PS1" variable in the file ".bashrc" located in your home directory, as long as you are using the Bash, of course, not the Shell. This is how to change the command prompt in Ubuntu, and presumably any other Debian-based Linux distro, judging from it being literally included in the code. 1. Open the file ".bashrc" located in the top-level of your home directory, you may need to press Ctrl+H to see the hidden files/directories. 2. Find the lines bold-marked below, and change them to your liking, with the help of the list of keys below. The lines below the default ones are how I've set up my own command prompt. 3. Re-open the Terminal for the changes to take effect, or if at the console/tty, relogin there. If you are running a non-Debian-based Linux distro, you'll obviously find other settings for "PS1" in the ".bashrc", but they should be similarly set up and easy to change. But if you don't find any settings for it in there, you can simply set them up yourself, derived from the code above. 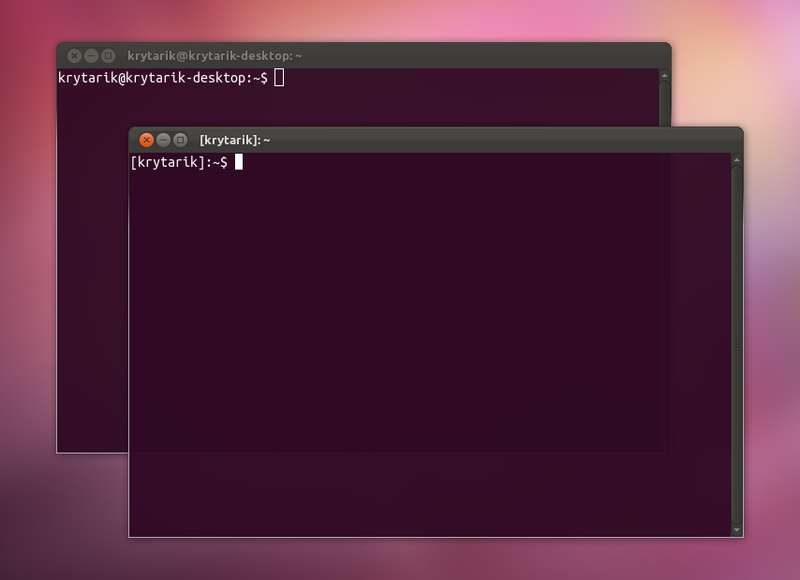 under SHELL BUILTIN COMMANDS below).